This page gives you two different directions to create a couch caddy. Pick which one works best for you or try both. A caddy can be used to store tv remotes, magazines, books, pens, pencils, crossword puzzle books, etc. You can stuff it with whatever you like to have lying around. 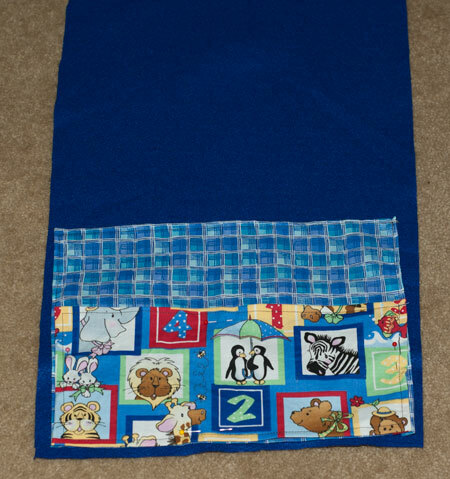 On your 10 x 13 piece of material, fold top edge down 1 inch and stitch in place. Turn remaining three sides in a ¼ inch and hem. Do the same for the 13 x 6 inch piece. Pin two pieces to the bottom of your felt with both edges touching the bottom. Sew the three sides of your material to the felt. 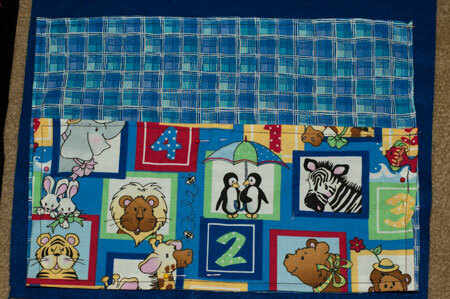 Sew down the center of the material to create pockets. You can also decorate with trim or ribbon along the edges using a hot glue gun or leave as is. Place your reading books, TV remotes, or whatever you'd like in the pockets. 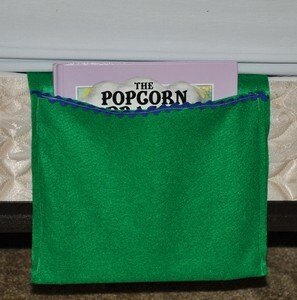 This can also be a bedside caddy by placing between your mattress and box spring. 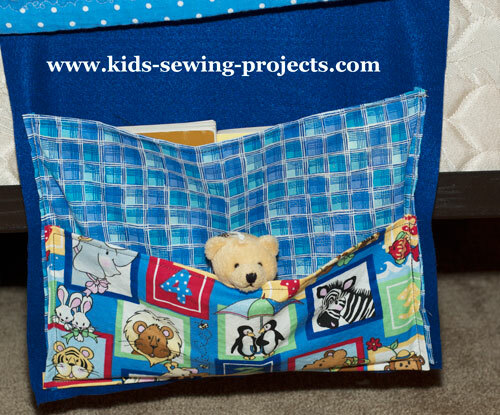 Here is a simple and quick project for a bed caddy or to use as a couch organizer. These directions just use one long piece of felt. 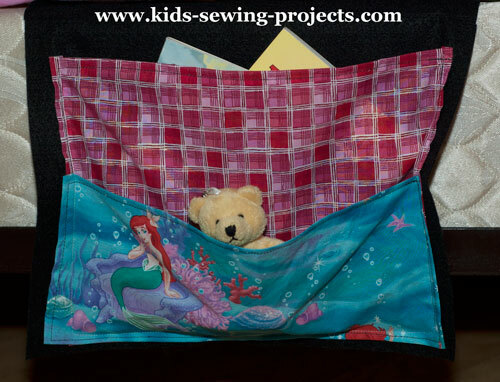 Take your felt rectangle and fold the bottom up 8-9 inches. Pin trim or other accessories on top. Unfold and sew details on. Hold up again and pin sides. Sew sides. Sew divider up the middle if desired. 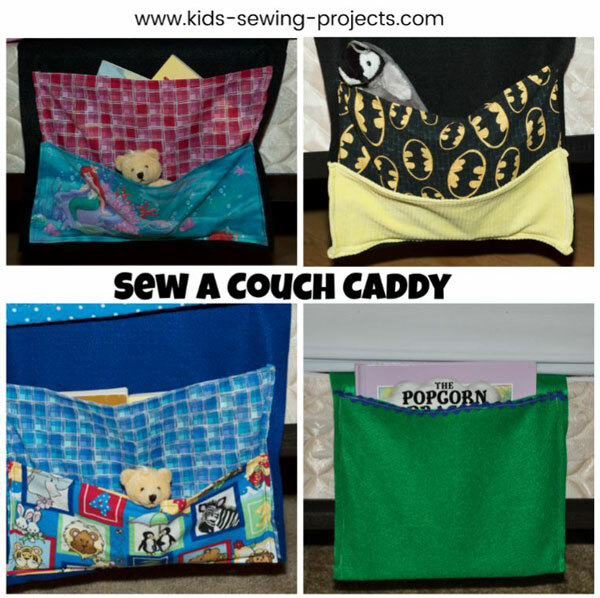 Back to kids easy sewing projects from sewing a Couch Caddy.